The beginning of the Scouting experience. 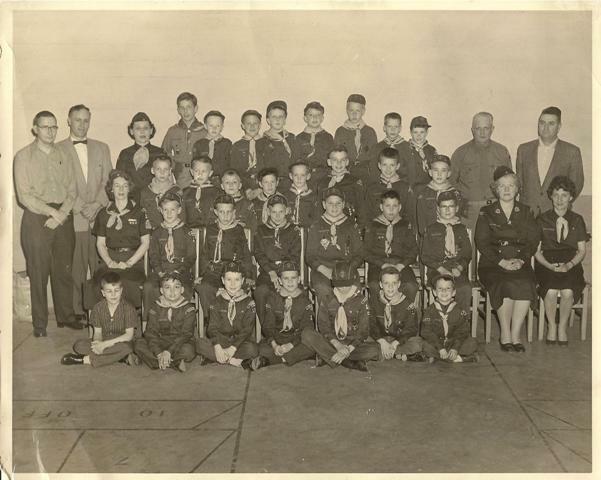 In the back row (l to r), Mr. Abby, unk, unk woman, unk boy scout, unk cub, David Cole, Philip Nichol, Larry Long, David Abby, Nathan Haley and John Herchenrider. In the row below that the last cub on the right is Hank Crumb. Sitting in the first row, first on the right is yours truly. Mrs. Abby is the second woman from the right in the second row. She was my den mother and first piano teacher. On the back of the photo is printed: Photography by Robert F Russow, Dominion Photographers, Box 2074, Phone DI-25018, Roanoke, VA. This photo preceded zip codes. Roanoke, VA circa 1957.